Hailing from Galicia, Spain, BLOODHUNTER was formed in 2008 by founding member, guitarist and songwriter, Fenris (Shroud of Tears, Yidorah). At the end of 2012, after a few line-up changes, the current line-up was set with Éadrom on bass, Phoghett on drums and Diva Satanica on vocals joining Fenris. Fronted by female vocalist Diva Satanica, this Extreme / Melodic Death Metal band rivals anyone in this male-vocalist dominated genre. At first look, Satanica looks like a runway model, but don’t let her looks fool you; her voice is truly extreme. If you just listen to their music without reading the liner notes, you’ll think a large bearded man was behind the microphone. BLOODHUNTER released the EP “The First Insurrection” in 2013 and they were on their way. 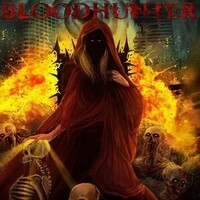 On their new, self-titled debut LP “Bloodhunter”, they sound as if they are aged veterans of this most extreme form of music. The talent is deep for a band that has been on the scene for a relatively short period of time. The 11 songs are brutal and fast but have melodic overtones that blend perfectly. Diva Satanica will have you researching BLOODHUNTER over and over again to confirm that it’s really her voice you hear coming out of your speakers. Fenris’ screaming guitar solos and super fast riffs are reminiscent of the old school Death Metal sound that has become so popular again. The thunder that emanates from the rhythm section is solid and heavy and will make your heart skip a beat. “Bloodhunter” will leave you with no doubt that this band’s intentions are to melt your face beyond recognition. I dare you to add an asterisk to this album as being a female fronted band. Only time will tell if you can take the savage beating that you’re about to get. If you’re a fan of VADER or ZOMBIE INC., or any other form of Extreme Metal, this is right up your alley. Marios Iliopoulos, founding member of the Death Metal band NIGHTRAGE, adds guest guitar solo on “Bring Me Horror”.